This is one of the strangest, most unique, most poignant books I’ve ever read. A fascinating, dark, witty mixture of Fiction, memoir, literary criticism. A work where meta-fiction and biography form a graceful dance, a book where reality and fiction are not two clearly distinguished notions. A work where despair, pain, loss, love, and expectations find their domain in Literature. In six chapters, Ugrešić leads in the world of a writer wounded by a terrible war, confused and troubled by the fact that there seem to be no clear lines between victims and criminals, haunted by the ghost of failure. The writer in Ugrešič’s novel talks of stories that contained characters undeveloped and neglected. What of the stories that were written and what of the ones that never came to be? Two women. A betrayed wife in Kyoto. The widow of a Russian writer, who seems to reach the status of a modern literary goddess in the eyes of the readers despite the fact that she never wrote a word, meeting our writer in Naples,, offering her wisdom. ‘’I don’t remember when I last saw stars,’’ I said. ‘’The stars are all we have here,’’ he laughed. ‘’Stars and landmines’’, I added. In a village in beautiful Croatia, our writer meets Bojan, a fascinating man whose job is to detonate the mines left from the war in the 1990s. A man of the law, a philosopher, a lover of Literature, a man who refuses to conform or identify with a particular country. Bojan was my favourite character in the book. He reminded me of a person very close to me (minus the risky job, thank God) and I loved him fiercely. The fox stands as a symbol of intelligence and secrecy. Of being a loner, a seductive force, an alluring adversary. A watcher in the night, an outsider. Ugrešić uses the beautiful animal as an image of the writer that sees her work scrutinized because of artificial perceptions. Are we all citizens of the world by choice or have we retreated into a subconscious self-exile, fed up with everyone’s stupidity? What happens when your views don’t correspond to the mob’s ideals? And what about war, the source of all evils in our world? From Kyoto to Naples, from Zagreb and Moscow to Amsterdam, Nottingham, and Milan, Ugrešić writes in witty, raw, powerful language. What is Fiction and what Reality? I wouldn’t dare to guess and it doesn’t matter. 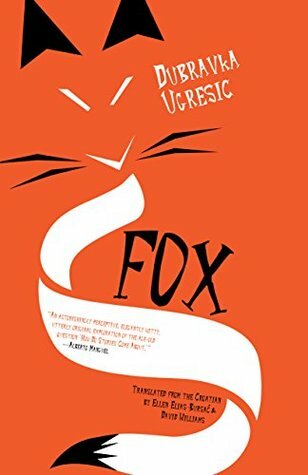 Fox is the work of an exceptional, brave writer, a book for brave readers. This sounds remarkable, Amalia. It’s gone straight on my list. Thanks for alerting me to it.